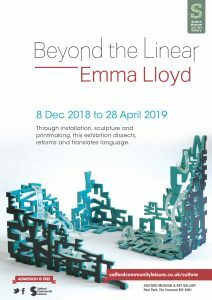 Solo show taking place at Salford Museum and Art Gallery. Preview on 12th December (17:30 – 19:45), all welcome to attend. 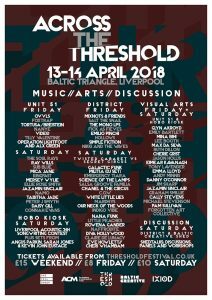 Following the success and building on the legacy of seven consecutive years, Threshold festival returns to the Baltic Triangle with a scaled down mini festival and industry event. With roots in the creative industries of Liverpool and the north-west, the festival will bring together artists, musicians, promoters, academics and enthusiasts alike. 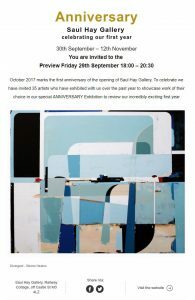 Omid Asadi, Alyson Barton, Julian Bovis, Paul Brotherton, Margaret Cahill, Mike Chavez-Dawson, Lisa Denyer, Tracey Eastham, Jane Fairhurst, Rachel Grimshaw, Gareth Griffiths, Susan Gunn, Catherine Harrison, Steven Heaton, Pete Hoida, Karol Kochanowski, Josie Jenkins, Emma Lloyd, Enzo Marra, Melinda Matyas, Andrew McIntosh, James Moss, Martin Nash, Georgia Noble, Jen Orpin, Mandy Payne, James Roper, Sabrina Schmid, Stephen Snoddy, David Stanley, Jo Taylor, Jason Thompson, Diana Terry, Patricia Volk and Olga Woszczyna. 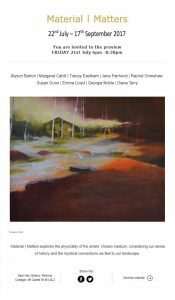 A group show featuring works from Allyson Barton, Margaret Cahill, Tracey Eastham, Jane Fairhurst, Rachel Grimshaw, Susan Gunn, Emma Lloyd, Georgia Noble and Diana Terry. Founded by Catherine and Ian Hay in 2016, Saul Hay works with emerging and established artists to present a diverse programme of contemporary painting, drawing, sculpture and photography. 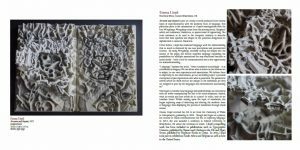 The 12th annual Art of the Book exhibition will feature new works by gallery favourites as well as artists new to the venue. Seager Gray Gallery specialises in contemporary fine art with a focus on works that combine content with a mastery of materials. Included in their program is a speciality in book-related arts. Partners, Donna Seager and Suzanne Gray have established in Mill Valley a premier gallery that takes the stage in international fairs, garners critical review, and is recognised beyond the San Francisco Bay Area.